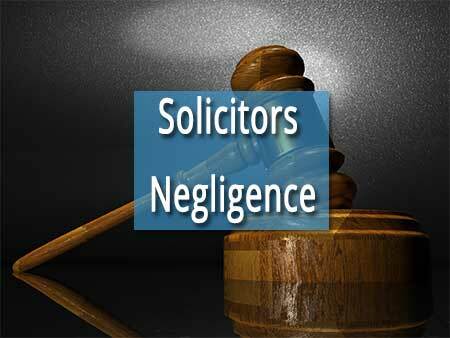 Negligence Claims Against Solicitors & Barristers. If a solicitor or barrister cannot supply qualified legal advice or cannot make sufficient representation in court procedures and you suffer loss as an outcome, then you might have a claim against that professional for damages. A legal practitioner has a duty to provide legal services with sensible care and ability. If your solicitor cannot do this, they may be in breach of their responsibility of care to the customer. The Irish Courts have determined that negligence is a form of unsatisfactory professional conduct or expert misbehaviour just when it goes beyond "mere negligence" or "simple negligence". One example of lawyer negligence might be the providing of wrong legal suggestions which results in monetary loss to the customer. Michael Monahan Solicitors Sligo can advise you on whether or not you have a case and start proceedings against the negligent solicitor call us now on 071 912 9070 or contact us online. What type of solicitors negligence claim can we assist you with? Personal Injury Negligence: E.G. where the solicitor advises to settle an insurance claim for less than it is in fact worth or misses a date by which the claim must be lodged. Litigation Negligence: E.G. where a solicitor or barrister acting for you in court procedures fails to meet a court due date which leads to your case being lost or fails to appoint correct advisors to give evidence for you. Business Transaction Negligence: E.G. where the lawyer cannot see a clause in a contract or lease which negatively influences you or gives bad recommendations on a case that results in you suffering some loss. Wills and Probate Negligence: For example, where a solicitor fails to prepare a Will in accordance with the clients instructions, causing loss. Failure to complete a property transaction resulting in financial loss to you the client. Delay in registering ownership and allowing a charge to be placed on your property. If you have received bad recommendations or poor legal services from your lawyer or barrister and your case is ongoing, we can frequently take control of the case with a view to reducing the effects of the irresponsible service you have actually received up until now. If it is not too late (six years )to take over an existing case and you are planning to make a claim against the negligent solicitor for the negligent service you have received, we can help call us now on 071 912 9070 or contact us online. Frequently Asked Questions about Solicitors Negligence Claims. Solicitors negligence is where a lawyer engaged by a client fails to give a proper service required of them with the skill and knowledge fairly expected of a solicitor. 1.Is there a duty owed? 2. Is there breach of the duty? 3. Is there damage /loss as a result? How much time do I have make a solicitors negligence claim? The current time-limit for taking proceedings in a solicitors negligence is 6 years from the date that the negligent act occurred. If I think I have a solicitor negligence claim what should I do? The first thing is to phone us and discuss without obligation. Following that if we think you have a case we will ask you to send us a summary email if possible giving the background to what happened and include any relevant paperwork. You sign an authority, which we provide to take over the file and we send that to the firm. You do not need to contact them. We get the copy of your file from your solicitor as quickly as possible. We will need the file in order to give a preliminary opinion on your chance of success. If you think you may have a compensation claim for solicitors negligence contact us now.